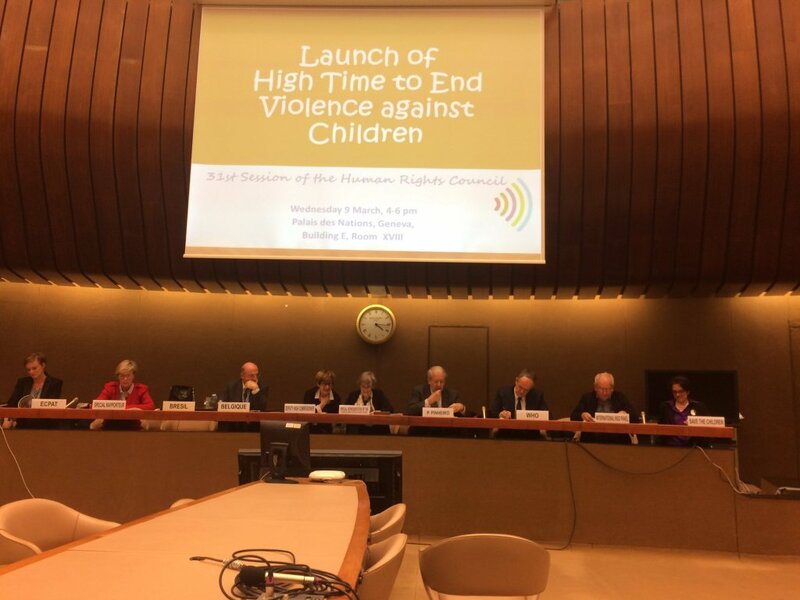 Geneva, 9 March 2016 - United Nations Secretary-General Ban Ki-moon supported the launch of the High Time to End Violence against Children Initiative on Wednesday 9 March. In his message to the participants, the Secretary-General stressed that every child has the right to freedom from all forms of violence. This is not just common sense and basic morality; it is an international legal obligation, enshrined in the Convention on the Rights of the Child, the world’s most widely ratified human rights treaty. “Last year, of the 2.2 billion children in the world, at least one billion children suffered from physical, sexual or psychological violence. This figure is so daunting that we may feel overwhelmed and powerless. But we shouldn't. Violence can be prevented, and we know how. It is high time to end all forms of violence against children.” said Mr. Ban. 2016 marks the tenth anniversary of the adoption by the General Assembly of the UN Study on Violence against Children and the twentieth anniversary of the first World Congress against the commercial sexual exploitation of children. In this a strategic year for children’s rights, SRSG Santos Pais launched the High Time to End Violence against Children Initiative aimed at amplifying and maximizing the opportunities to engage at international, regional, national and local levels towards the common goal of ending violence against children by 2030. “The Initiative believes in the transformative power of leaders from all walks of life and people’s determination to stand up for children. It is an innovative talent and time raising effort to stimulate and support positive, visible and concrete initiatives to end violence against children worldwide and reach violence-related targets in the Sustainable Development Goals, especially target 16.2.” said SRSG Santos Pais. Deputy High Commissioner for Human Rights, Kate Gilmore, reminded the legal imperative to eliminate violence against children and stressed that violence is preventable. "Every society, no matter its cultural, religious, economic and social background, has the capacity to stop violence against children and must do so." said Ms. Gilmore. Member States, UN actors, Civil Society organizations, Ombudsman for children, and other child rights activists Mr. Paulo Sérgio Pinheiro, including the independent expert who led the UN Study on Violence against Children joined the event and pledged to devote time and talent to make the initiative a global success. One of the highlights of the launch was the participation of the winner of the Children"s Peace Prize 2015, Abraham Keita, who advocates for child protection from violence in his country and who gave voice to this powerful video. “I experience violence every day. In my school and my community in a country that turns a blind eye to child protection,” said Keita. "I believe that every person, no matter the age, can be an agent of change. I call on you to join the movement so that the sum of all forces be Zero violence." Following the event, organizations and citizens around the world pledged their commitments and raised their voices against violence.